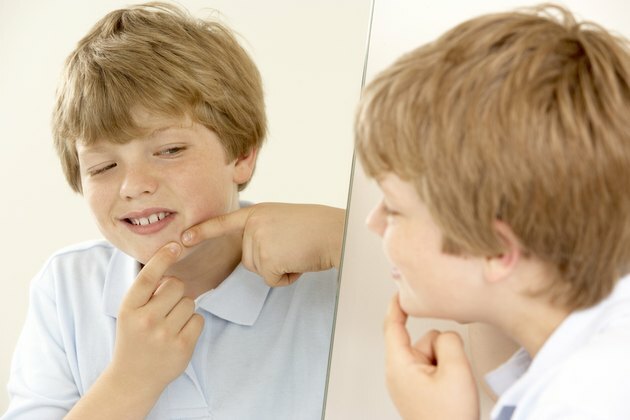 Acne is a skin condition that usually affects the face, chest and back. When skin pores become congested or clogged with dead skin, oil and bacteria, breakouts occur in the form of pimples, blackheads and cysts, which often swell up and leave small scars when they are drained or reduce in size. Scarring from acne is not inevitable and one way to minimize scarring of tissue is to use baking soda, a natural exfoliant. Mix two parts water with one part baking soda with a spoon to form a thick paste. More water or baking soda can be added to reach the right consistency. The paste should not be runny and be thick enough to be pinched between fingers. Stand in front of a mirror and apply the paste to the acne scars with fingers, covering the entire surface of the scars with the paste. Let the paste sit for two to three minutes. Rinse the paste off the scars with fresh water and pat scars dry. Repeat this process twice daily for best results. Med He: How To Get Rid Of Acne Scars?